There were several surprises in section play. Capital City's Mark Hannah caused the first upset of the Tournament with his confident win against Waikato's Darren Taylor. Darren Taylor failed to qualify. Capital City's Ross McNab now has the nickname "The Giant killer" when he played very well to get a victory against Derek Gibb (CC). Local Lad Mark Hannah has always shown promise in Billiards, his Dad- Robbie Hannah, a wonderful Billiard player himself having been the Otaki RSA Billiards Champion 39 times, has coached his son in both forms of Cue Sport, Snooker & Billiards. Adesh Shekatkar flowed when beating Derek Gibb in their section play match. Another very popular qualifier was Russ Delahunty who also with his computer, recorded the results and set games in motion so his performance was indeed meritorious. Mark Taylor was also in a tough section, but he did play very well and earnt his place in the last 8. Quarter finals (2 hours) had Zac Guya (CC) getting up against "Giant Killer" Ross McNab (CC) 351-198, Mark Hannah(CC) bt Russ Delahunty(CC) 353-273, Wayne Carey (AK) bt Derek Gibb(CC) 286-150, Adesh Shekatkar(WK) bt Mark Taylor(WK) 518-337. In the 2 hour semi's, Mark Hannah stayed with Zac Guya for some time with Guya's experience helping him to conquer Hannah 350-256. The other semi had Adesh Shekatkar always playing better than Wayne Carey and the score didn't reflect the dominance Shekatkar had while winning 400-349. The 2-hour final had the current Waikato Champion Adesh Shekatkar taking the early lead with the popular Zac Guya, a past North Island Billiard Champion, trailing most of the time. Guya's long losers weren't happening and these let him down badly but the reflection of the final score showed just how close the game became, Shekatkar winning 368-353 and getting his name for the first time on this time honoured "North Island Billiards Championship" Cup. Highest break went to Derek Gibb with a nicely constructed 111. Adesh Shekatkar, originally from India, with a high tournament break in his home Country of 278, is an exciting prospect for NZ Billiards as he got his NZ Citizenship on 5th April 2017. His results will be closely watched when he competes in this year's NZ Billiards Champs at the Woolston Club at Christchurch in July. Also worth mentioning is that the ... whisper is out ... that a few of the Snooker players will be dabbling in Billiards after this year's NZ Snooker Champs . a wonderful thing to happen and once they get the "BB" - (Billiards Bug) they could quickly climb the ladder and some may become "dual NZ Reps" which some of our "greats" have already achieved. Younger Snooker talent in the form of Cody Turner (Capital City) who played in the Clubs NZ Billiards Championship at Tauranga during the week and the 2016 NZ u21 Snooker Champion Mikey Stewart are both now `tampering' in Billiards, this bodes well for the future of this wonderful Cue Sport game. Also Gavin Kershaw (UK) visiting New Zealand on a working holiday added excitement with his entry into this tournament. NZBSA Board Member Neil Gyde was up from Wellington, evergreen 82 yr old Ron Milicich, English born Andrew Draper (WK) who is now living in and working out of Tokoroa, Auckland's Wayne Carey, and Darren Taylor (WK) who had recently played in the Christchurch Open Billiards `dealing' to the Southerner's and almost bought back a 'Christchurch Trophy' to the North Island, something none of the Rugby Teams look like doing this year. Section play was all 60 minute games with Grant Hayward (AK) going thru unbeaten. Hayward, who has had a Billiard World Ranking #25, only enters the odd tournament every year, wins most, but seems to prefer the 18 pocket game - "Glof". He is a pleasure to watch, confident potter, a wonderful cueist with huge experience in Cue sport having excelled in Snooker, Pool and Billiards. 90minute semi's saw Hayward attracting a watchful crowd, was on fire with two century breaks .. 121 & 101 against Draper winning 573-111 . The other semi had the consistent Carey (47,54,84,69) getting past Taylor 525-195 . 2 hour Final had Carey (42,50,73) winning 517-245 over Hayward (42) who just couldn't get the flow on as he had done over the most of the weekend. This is Carey's ... 120th recorded Provincial and NZ Championship's win ! The Canterbury Billiard Championship was played over the weekend of the 22-23rd April at the Woolston Club. 8 entries were divided into two sections of 4 with games over 2 hours throughout section play and post section play. The initial draw had a withdrawal of Peri Lilii due to ill health with Paul Wereta slotting directly into his slot in the draw. This made section two wide open with 4 good players vying for two qualifying semi-final spaces…. Section 1 saw Gary Oliver dominate winning all his games comfortably with a dog fight between Lyndon Bradford and peter Gormley for the other qualifying spot. Their match as it turned out was the last section play game and was a great fight out both trying to get that semi spot. The lead changed hands throughout the match and it was only ever going to be who was in front when the bell went that decided the match, as it turned Gormley was successful by 7 points. Section 2 as I said was the tough one as it had similar quality throughout it. Wereta straight away caused an upset beating Peter de Groot… then accounted for Geoff Lilly… Maurice Lancaster got beaten by both Lilly and de Groot which meant the last section play game here too was a head to head for qualification between de Groot and Lilly. De Groot got out of the blocks early and managed to dictate terms over Lilly who was chasing points. De Groot lived off mistakes and although breaks were not big he was consistent. So the final was repeat of last years with Oliver v Wereta…. Could Wereta’s resilience last? Neither player played well in the final, both looked out of sorts with the table… Oliver made bigger breaks that was all but still appeared frustrated with his play in the final. Two breaks over 50 a 79 & 63 was all there was to show by both players. Final score of 491-243 to Oliver looks dominant but both have a lot of work to do 11 weeks out from the Nationals if they want to make an impression in July. played at the Onehunga RSA, Princess Street, Onehunga, Auckland on 9th April 2017. Isn't Cue Sport a wonderful sport ! Entries to the Auckland Billiards Championship where from ages 21 yrs old Mikey Stewart (current u21 New Zealand Snooker Champion) to the evergreen 82yr old Ron Milicich. It was with much excitement in watching the youngster Mikey Stewart tackle Billiards. This is his first Billiard tournament ever, but Stewart showed his willingness to learn and his potting was sensational. NZ Billiards needs a young talent like Stewart and with more games under his belt, he will quickly climb the NZ ranking list. Mikey Stewart showed some lovely `touches' and displayed an enviable cue action which had spectators and competitors admiring and appreciating. Hibiscus Coast's Bryce Good went thru the 75 minute section play games unbeaten, and the 2 hour Final was between Good and the 24 times and current Auckland A Grade Champion, Wayne Carey. The two swapped points early but Good failed to show the consistency he had in section play and Carey being well pleased to claimed this Akl A Grade Billiard's Title now 25 times. 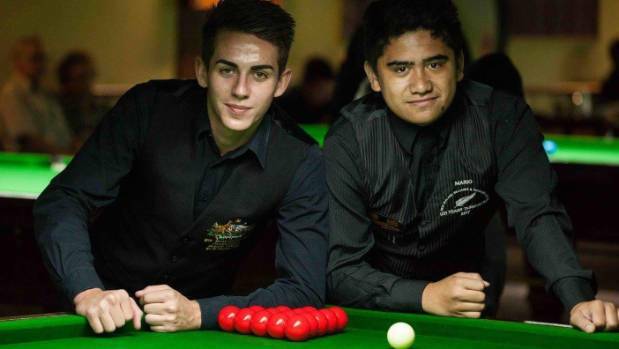 Cale Barrett and Mario Hildred ahead of the under-21 Oceania Snooker Championship final. After a valiant effort, Taranaki's Mario Hildred came within touching distance of taking out the under-21 Oceania Snooker Championship. Hildred, 16, was one of six Kiwis to attend the event in New South Wales earlier this month and finished runner-up to Australian Cale Barrett, losing 6-3 in the final. Barrett would have gone into the final as the favourite, having beaten Hildred 3-0 in pool play, but Hildred was able to put up a fight in the best-of-11 final format. The New Plymouth Boys' High School student sneaked his way into the playoffs after finishing with three wins and three losses in pool play, but came into his own in the knockout stages. In the quarterfinal, Hildred managed to get the better of Australian Hayden Goode 4-3, before thrashing fellow Kiwi Pravil Kant 5-0 in their semifinal. New Zealand junior snooker team manager Agnes Kimura said she was thrilled with the results the Kiwi boys produced at the tournament. "It was wonderful," the current New Zealand women's champion said. "Of the eight players to make it to the knockout stages, five were New Zealand boys. I don't think the Australians would have seen that coming." Fellow Kiwi team member Louis Chand won the event last year, but was easily put away by Barrett in their semifinal 5-0. Great to see Auckland's Bryce good back playing again, and Kevin Crighton (WK) qualifying into the 'last 8'. UK's Andrew Draper had a very close game with Darren Taylor(WK). Adesh Shekatkar was on a 94 break when the `bell' went against Mark Taylor (BOP). A wonderful cueist with heaps of ability and knowledge of Billiards, Shekatkar has had a tournament break of 278 in India, and been in New Zealand for some years now, has married here and it thought by plenty to be a "New Zealand Champion" in waiting now that he has residency. In the semi's, Paul Stocker (HB) bt Englishmen Andrew Draper and Wayne Carey got a off to a `flyer' against Adesh Shekatkar (WK) with breaks of 78, 119. 90 and 70 to avenge his defeat by Shekatkar who won the Auckland Open Billiard against Carey a week earlier. The FINAL was another `Carey vs Stocker'. Apparently, these two have played each other 110 times over the years with results being pretty evenly shared. Stocker is a terrific `hazard' player who has 3 'NZ Open Billiard' titles, a 'NZ Champion' title and he has also been the North Island Billiard Champion 9 times. Carey is not short on `Titles' either ... 5 `NZ Billiard Open's, 3 `NZ Champion`, and also 9 N-Island titles. This final could have gone either way, Carey opened up early with a 109, and this one break seemed to be the difference with the players matching points with a 140 point winning difference being in Wayne Carey's favour when the bell went at the end of 2 hours. Tournament Director : Mr Dan O'Sulllivan, Waikato. 10 initial entries dropped to 8 and was decided amongst the entries to play 1 section of 8 so everyone present got to play each other at least once. Section play was therefore over 1 hour games with the Semi’s and Finals of the Main draw and Plate both over 2 hours. Massive thank you to all the players who entered, Darren for travelling from Hamilton to play, CBSA for their financial support to the tournament and Woolston Club for the excellent facilities and hospitality. The inaugural Champion of Champions tournament was held this evening under Speed Billiards rules at the Hamilton Cosmopolitan Club. An invite was extended to 2016 NZBSA tournament winners and the balance of the field was comprised of ‘wild card’ players dependant on ranking list position to make up a tournament friendly number. Speed billiards was a new format for seven of the eight competitors and it became evident that strategy differs quite a bit from a standard game of billiards. Quarter finals and semi-final ties were drawn out of a hat for 40 minute games. Players could also win automatically by scoring a 10-shot or making 15 consecutive hazards. 1/4s results were Andrew Draper 162 – Mark Taylor 122, Wayne Carey 219 (52) - Paul Stocker 120, Darren Taylor 173 - Adesh Shekatkar 163, Russ Delahunty 116 - Kevin Crighton 113. Semi finals results were Darren Taylor 212 - Andrew Draper 114 and Wayne Carey 135 - Russ Delahunty 89. Final result was Wayne Carey 113 - Darren Taylor 89. Wayne scored the victory by making a 44unf with 15 consecutive hazards. Congratulations to Wayne Carey - the inaugural winner of the Champion of Champions tournament. Over 150 years of experience played out this Final! Played at Snooker World, 713 Mt Albert Road, Royal Oak.